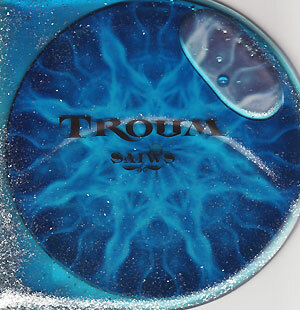 German ambient duo Troum's newst release called "Saiws" has been released as a picture disc 7" 33 1/3 rpm vinyl limited to 179 copies. As much as I am trying hard to remind myself and the readers that ultimately we are talking about music here, it is hard not to talk about the visual presentation of "Saiws", because it is without a doubt one of the most beautiful musical artifacts I've ever held in my hands. "Saiws" comes encased in a transparent water-proof plastic die-cut printed liquid gel pacck sleeve. The sleeve-bag is filled with a blue gel and some glitter to represent sand and the whole thing was designed by artist Alan McClelland a.k.a. eyel.lyft. It's hard to really describe how stunning this object is so I'd invite you to check out the great pictures at the label's website page for this release (http://www.chronoglide.com/Equation_mc27.html). Water is obviously the main theme here. "Saiws" is an old german word for "sea", the primordial element from which we came from and to which we will return. Troum was inspired by sea, water and sand and created two fluid and ethereal tracks of beautiful guitar drones that sound quite solar and almost hopeful, rather than dark and somber. The diluted tones and chord changes depict an image of vastness and grandiosity, and if it wasn't for the sea gull evoking sounds of the title track I would almost say that it makes me think of a desolated and lonely aftermath, the sea to which we will return, in a way. The other side is entitled "Segeler" (german for sailor) and is a bit darker in tone, but nevertheless not murky. Troum calls it "a soundtrack for oceaning imaginations" and the soundscapes are of oceanic proportions, as if the line at the horizon is blurred and you can't see where the water ends and the sky begins. As you might imagine this will set you back quite a bit financially (around 30 bucks I believe), however, should you decide to buy it, you'd be one of very few lucky ones. This is a rare and truly astonishing workd of art and Troum decided not to do any twitter, facebook, myspace, not even a digital download. The only way to have this music is to buy the vinyl and there are only 170 of them total, so you better hurry. Chain D.L.K. is honored to be deemed worthy of one.